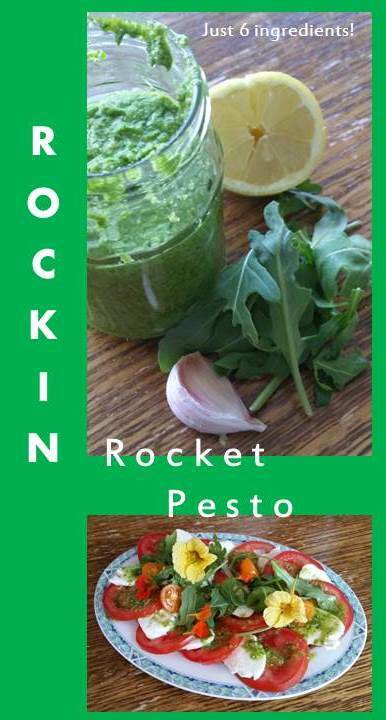 If you ever tried growing rocket (or arugula) you know it grows like a weed. You can eat these lovely leaves every day once your rocket plants get going. In Holland you find them in the wild too. They grow on sandy soil, so you find them in the dunes, next to rail roads and just on side walks. 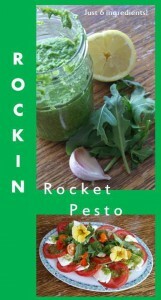 If you are lucky enough to have an abundance of rocket, you might be looking for a new way to use it up. I like to do this by making my own pesto. This recipe has no exact quantities, I suggest going with your instincts, and go by what you have in your fridge and adding ingredients to your taste. I grind and mix my ingredients in my trusty little blender. Make sure you have enough oil in the blender. Store your pesto in a jar or container in the fridge. Keep a layer of oil on top of your pesto to keep it fresh. Eat it within a week, but for us this is not a challenge! This pesto is lovely as a dip with some home made bread, on your (meat) sandwich or through your pasta. 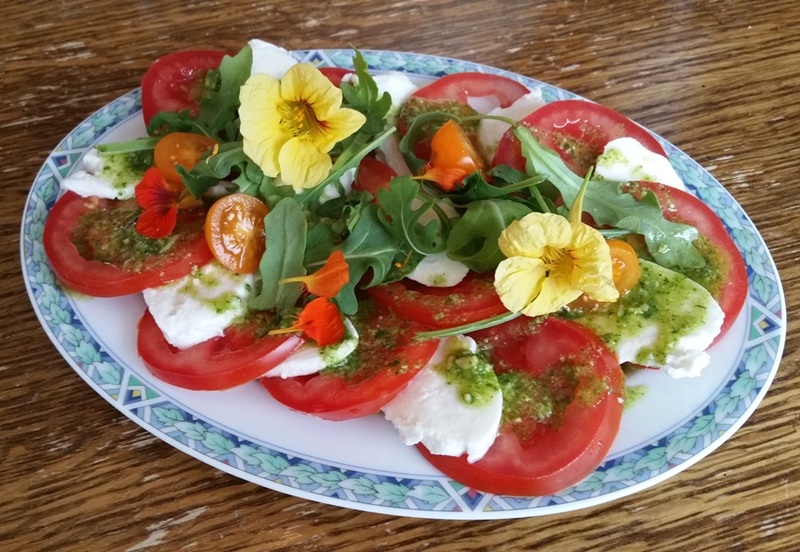 If you add some more oil and lemon juice, it makes a lovely dressing for your tomatoes and mozzarella salad. This recipe works with basil or fenil tops too. 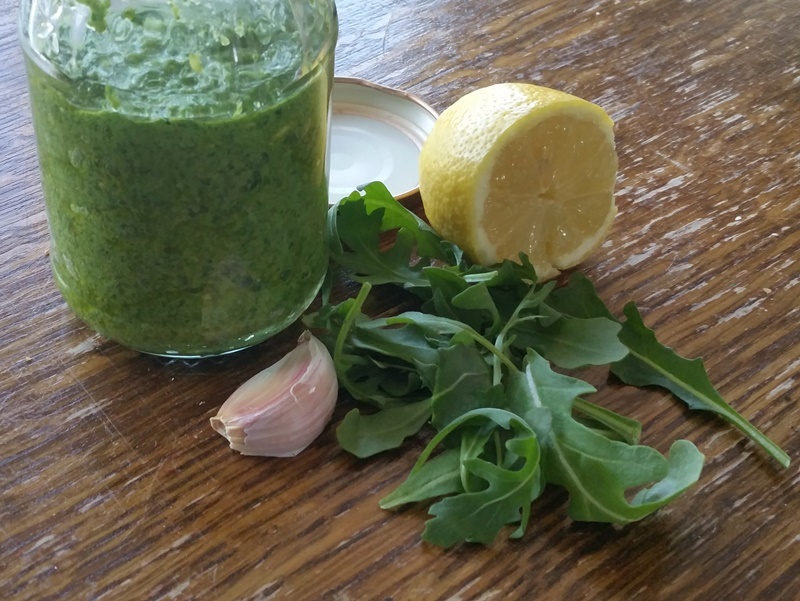 This entry was posted in Food & Drink, Garden, metnlintje and tagged arugula, cashew, cheese, dip, dressing, garlic, italian, lemon, nuts, olive oil, pasta, rocket, salad, sauce, side dish by elsje. Bookmark the permalink.